Installing the Z Directory library. 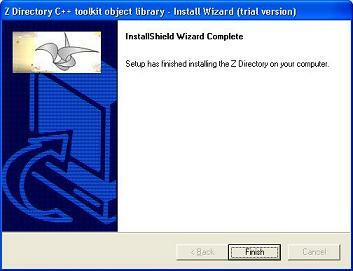 Uninstalling the Z Directory; removal. compiler setup: configuring Microsoft Visual Studio. Creating a program that uses the Z Directory. making an MFC (GUI) program with the Z Directory. Z Directory setup - install. 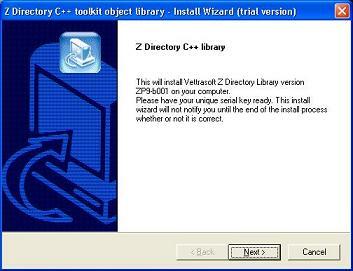 The Z Directory is installed on a computer via a setup wizard - installer program which can be obtained from Vettrasoft. The simplest way to do that is to download the it from the download page . The free trial version is good for 90 days from the date of install. 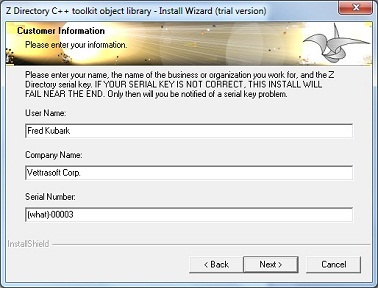 It can only be used once, and wil not work without its own serial key. The setup wizard is straightforward. It will set the environment variables ZDIR_INCLUDES and ZDIR_LIBHOME (as user variables). Any previous values will be over-written. Installing Z Directory Trial Version requires a functioning Internet connection. 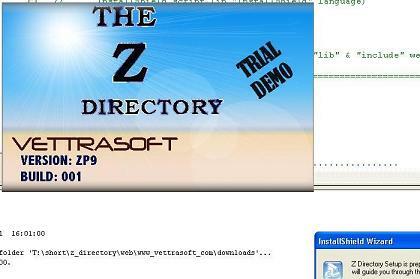 This will register your Z Directory installation with Vettrasoft. Press Finish, and the Z Directory object toolkit library will be ready to use. Your compiler or IDE (such as Visual Studio) will have to be configured to use the Z Directory (Vettrasoft has a auto-configure program for Visual Studio currently under development). The steps are described below. Removing the Z Directory: uninstall. 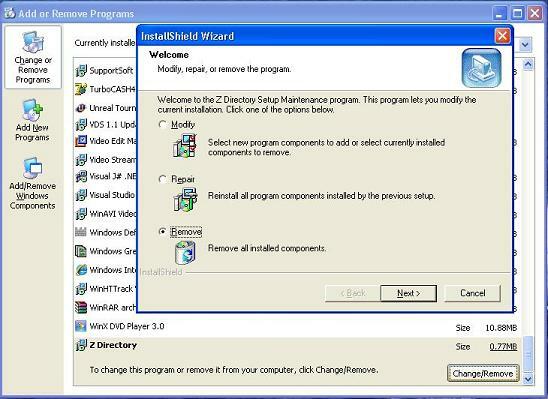 Run the uninstall: from the Control Panel, go Add or Remove Programs (the exact route to this may vary depending on your flavor of Microsoft operating system). 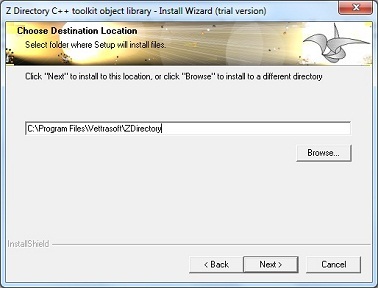 Scroll down the list of installed programs until you see "Z Directory", click-highlight it, and press the Change/Remove button. The exact route to un-installing programs in Microsoft seems to vary wildly from version to version of their operating system, so this is only an approximate guide. These are local versions of some required DLLs used by the Z Directory; the wizard removes the local instance of this file within the Z Directory. If you have them elsewhere on your computer, those files will not be effected. 1. Add the environment variable ZDIR_INCLUDES to your project's "Additional Include Directories". 2. 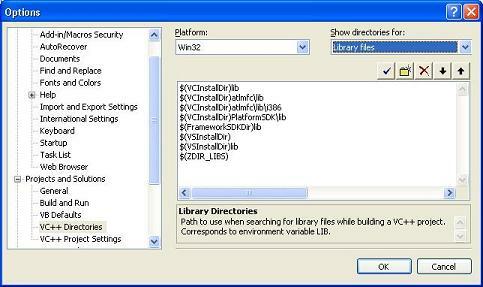 For 'release' type programs, add environment variable ZDIR_LIBHOME to your project's "Additional Library Directories". For 'debug' mode programs, use environment variable ZDIR_DEVLIBS. 4. add the variable zcc_msvisucxx to the list of #define's in your project. 5. in your program, add calls to Z Directory functions z_start() & z_finish() to the main driver ("z_start()" goes near the top of the entry-point in your code; "z_finish()" should be the at or near the last line of code to execute). Note that the last two are Microsoft libraries. If you use anything over layer 1 (that is, most programs), you will probably need these also. There is another way to set up these two environment variables - instead of plugging them into Visual Studio's overall settings, they can be added to a single, specific project. To do it this way, in Visual Studio, right-click on the project (in the Solution Explorer pane), and go Properties > Configuration Properties > C/C++ > General, and in "Additional Includes", put $(ZDIR_INCLUDES) While still under "Configuration Properties", go Linker > General, and set "Additional Library Dependencies" to $(ZDIR_LIBHOME). Again: this is an alternate route for setting up the 2 path variables, as described above. Make sure that your "run-time library" is set to "Multi-threaded Debug (/MTd)", for degug-mode programs, or "Multi-threaded (/MT)", for release-type programs. This is found in your project (select-highlight the project by right-clicking on it in Visual Studio's Solution Explorer window), here: Properties > Configuration Properties > C/C++ > Code Generation. Change the "Runtime Library" setting from the default value "Multi-threaded Debug DLL (/MDd)" to "Multi-threaded Debug (/MTd)" [or simply "Multi-threaded (/MT)", for release mode]. The Z Directory uses many system calls, especially in networking, liberally employing sockets. 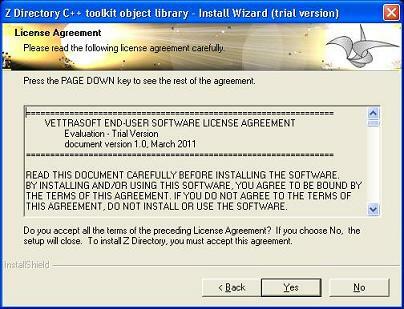 On Microsoft platforms, that means using the WinSock implementation. It is necessary in Microsoft Win32 environments to perform some initialization code so that some functions in the operating system will work. For example, all socket system calls in Microsoft's Win32 API require a call to WSA_Init(), or else associated functions such as gethostbyname(), listen(), select(), etc. will fail. Rather than worrying which Z Directory library components access OS functions that require such initialization, just invoke z_start() when your program begins, and call z_finish() upon exiting. This will handle internal initialization and cleanup. These 2 functions will do all internal startup initialization and post-processing required under the OS it runs on. It is encouraged to have programs on all platforms to use these functions, as future changes to the Z Directory may precipitate new initialization requirements. Also, other OS's may have their own quirks. Unfortunately, these function calls cannot be buried inside inside the Z library (these calls fail to work when done from within a library). This has to do with the fact that certain ADO/COM initializations (eg "__uuidof(ADODB::Recordset)") fail if done in [non-main] threads. Basically, call dbbi_o::main_init() in the non-threaded part of your code before accessing any layer-4 SQL objects. making a GUI program with Microsoft Foundation Class Library (MFC). You can make window-based (eg GUI) applications using MFC that fully utilize the Z Directory. This section covers what has been found to work - hopefully it is enough to get you on your way to doing the same. Note that the steps below does not constitute a full reference manual. 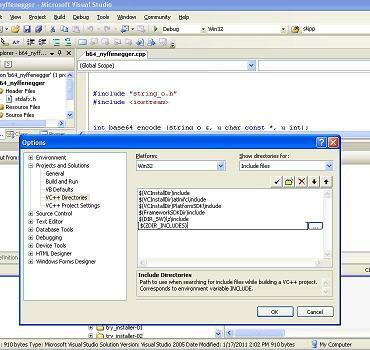 Using Microsoft Visual Studio (in this case, [the aging] Visual Studio 2005), make an MFC application. 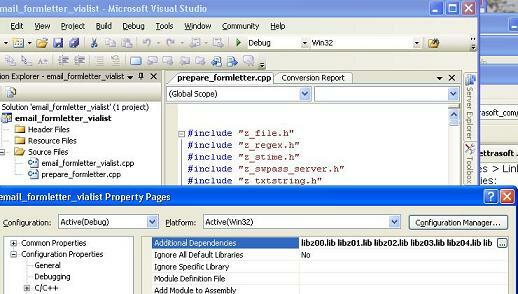 In Visual Studio, go: File > New Project..; select MFC Application. select Single document application type, with Document/View architecture support. For Use of MFC, select Use MFC in a static library. Also select (the default) "Use Unicode libraries". ["Compound Document Support" pane]: leave the default (None). Click Next. For ["Document Template Strings" pane]: use whatever you like. In this case, leave this pane alone and click Next. ["Database Support" pane]: in this example, leave this pane to its default values ("None") and click Next. for User Interface Features - click Next. ["User Interface Features" pane]: as with the previous pane, leave this pane to its default values (or configure to taste) and click Next. For ["Advanced Features" pane], we opt for the simplest case. 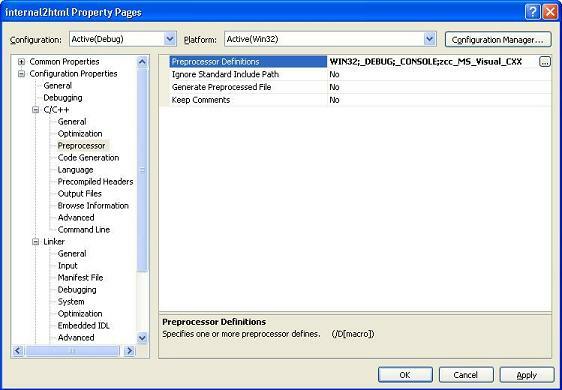 In this example, de-select "Printing and print preview", "ActiveX controls", and "Common Control Manifest". Click Next. ["Generated Classes" pane]: use whatever you like for class name, .h file, and .cpp file. For "Base class", select the "CFormView" from the drop-down list. Note: this is only our boilerplate example here! Click Finish. Ignore the warning about no printing features available (press "Yes"). Make sure the Solution Explorer tree is visible (go View > Solution Explorer). select the project, right-click on it, and open up the Properties windows (go: Properties). Go Configuration Properties > General. For "Use of MFC", select "Use MFC in a Static Library". Go Configuration Properties > C/C++ > Code Generation. Set "Runtime Library" to "Multi-Threaded Debug (/MTd)". Note that odbc32.lib and uafxcwd.lib are explicitly specified here, whereas for console-based applications this is not required. This is particularly vital if using components declared in the header file z_rawmfc.h. unresolved external symbol _SQLFreeHandle@8 referenced in function.. The header file, z_rawmfc.h, although located in the same includes directory as the all the regular Z Directory header files, is not considered to be a part of the Z Directory libraries. Also the source files (aptly named ms_vomit.cpp and mfc_vomit.cpp) are not compiled into the Z Directory. The reasons are twofold: (a) the function signitures are completely Microsoft-dependent (and STL), involving types such as CString, wchar_t, std::string, and CEdit; and (b) compilation requires an MFC context - the Visual Studio project, and hence the corresponding object modules emitted, are of different types (requiring different CRT runtime support modules) and cannot be linked together. In order to use them, the source code and header files should be included in your MFC Visual Studio projects and compiled into object (.obj) module files. The resultant object modules are then linked together with Z Directory libraries in the usual way. Hopefully this section has revealed all the tricks and tips needed to be able to use MFC with the Z Directory. You may encounter some problems compiling and linking. Be sure your program calls "z_start()", which calls WSAStartup() (Microsoft sys call) internally. You shouldn't need to explicitly include networking library (eg winsocks), such as Ws2.lib. Visual Studio seems to have a peculiar problem of failing to properly link to Z Directory items otherwise. Most of the other settings are the default values. multiple definitions of system call functions at link time. This problem appears typically only in Visual Studio 2005. You'll need to change the "runtime library" option, from "Multi-threaded Debug DLL" (/MDd) to "Multi-threaded DLL" (/MD). Right click on the project name, click properties, go to Configuration Properties > C/C++ > Code Generation, and change from "Multithreaded Debug DLL" to "Multithreaded Debug". Make sure to do this for both debug and release options. error LNK2019: unresolved external symbol _GetAdaptersInfo@8 referenced .. If you do not use functions or objects that rely on things like getting the computer's IP address (found in layer 2 computer_o class), you normally should not see such errors (unresolved externals). However, that is highly dependent on the linker you use, which may vary between operating systems, sub-classes of OS's (eg Micrsoft's family of post-NT systeams), and even versions of linkers. If you are getting unresolved externals error messages from the link process, you can add these libraries, prefereably one at a time. Recompile after adding each library. repeat this until there are no more link-time unresolved external errors. You should keep the list as short as possible, to minimize build time. The above list is quite comprehensive and is way more than enough (hopefully). 'release' (production) mode programs fail to operate correctly. Certain operating-system specific operations, such as accessing the Microsoft registry, may not perform correctly under 'release' mode compiled programs. There is a current known problem being currently investigated. 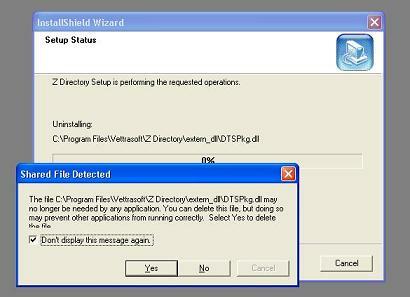 If you experience such difficulties, please do not hesitate to report it to Vettrasoft. 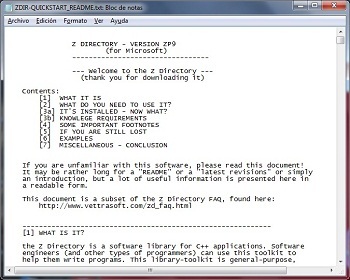 If you uninstall the Z Directory, you may see odd pop-up warnings to the effect of "you are using an unauthorized version of the Z Directory", or something similar. These are benign - simply click on the OK button and let it proceed. It should uninstall. The reason for this is that certain uninstaller program components of the Z Directory expect certain registry entries that have been deleted. This is a known, low-priority issue at Vettrasoft currently. container "size()" member function unresolvable by the compiler. parameter, so a declaration of "size" must be available. program crashes when running in a thread (SQL-group). In the SQL components of the Z Directory, starting with [L-4] dbbi_o, on Microsoft Windows environments ADO functions exist. Some COM initialization related to using ADO does not work when run in a thread. The solution is to call the function dbbi_o::main_init() in the main, non-threaded part of the application prior to creating threads. This is a static function, so it should be prefixed with "dbbi_o::". This issue is describe above.